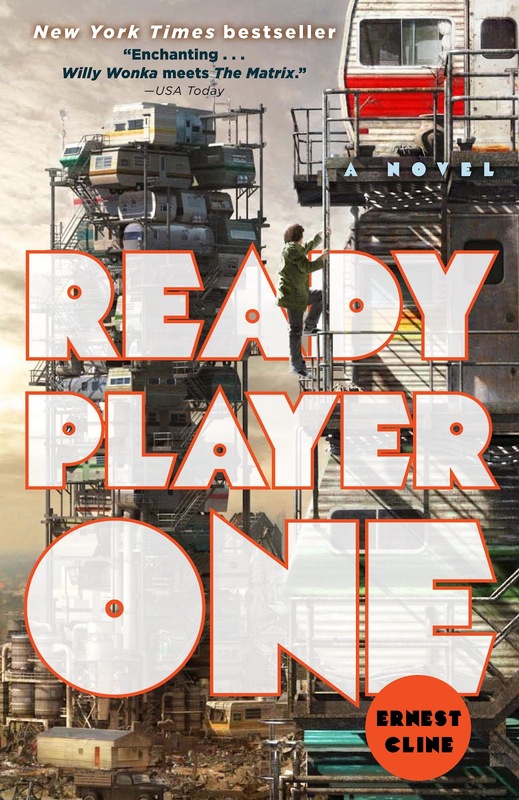 On The Tattooed Book today I review Ready Player One by Ernest Cline. In 2045, a future where poverty has swept the world, where the energy crisis has spun the economy into collapse and slums are made up of piled high mobile homes instead or flats and houses, a high school kid called Wade clings to his one chance of escape. A few years earlier a reclusive, bachelor billionaire named James Halliday died, leaving behind a message that rocked the world. Halliday was one of the creators of the interactive virtual world known as the OASIS. He was originally a computer games designer but this led him into creating a virtual world that took the real world by storm. People’s entire lives began to revolve around the OASIS. Soon kids had to log into it to attend virtual schools, travel simply became a thing of the past and soon money in the virtual world became just as important as in the real world. In Halliday’s message, he informed the world that he had hidden an ‘Easter Egg’ inside the OASIS. An Easter Egg is a hidden part of a computer programme and Halliday promises the first person to discover that egg will win his fortune. There are three keys to find and riddles to solve first but Wade knows he can find it. The world studies Halliday’s entire life and everything he’s ever written. He was obsessed with the 80’s, the games, the music, books and movies so Wade follows in suit. He reads, plays and watches everything he possibly can, hoping something clicks and that he’ll become the one to find that egg. When the first key is found and the race is on, Wade suddenly realises that not everyone is into playing fair and there is far more than money at risk. I should probably explain that it has taken me a while to read this book as my boyfriend read it first, who fell in love with it and passed it onto his best friend, who passed it on to his friend etc. So that probably gives you a pretty rough idea of how much fun this book is. If you were born in the 80’s and have any sort of ‘gamer’ blood in you whatsoever, you will LOVE this book. With references to everything from Wargames to Golden Axe, virtually every page will give you a nostalgic grin. My personal favourite reference (due to a misspent childhood messing about with phonebox tones, reading books about Kevin Mitnick, absorbing various computer manuals and playing with war diallers) was of the Captain Crunch whistle. A toy was given away in an American cereal that emitted the exact tone required to make free phone calls from booths (100% true). The more you know about geeky 80’s pop culture, the more you will enjoy this fast-paced, virtual treasure hunt of a novel. As for the writing, it’s simple and comes across effortless, the perfect style to sweep you up and carry you along. If you finish this book and it doesn’t leave you grinning from ear to ear, you have a heart of stone and I’m pretty sure we couldn’t be friends.